The forthcoming storyline of Colors most popular & most innovative daily soap Shakti will showcase interesting twist as Saya & Kinners re-unite Harman-Soumya, Soumya in fix. So far we have seen that Soumya have left Harman and turned Tarana. Harman tried various ways to win Soumya back but Soumya paid no heed to Harman. 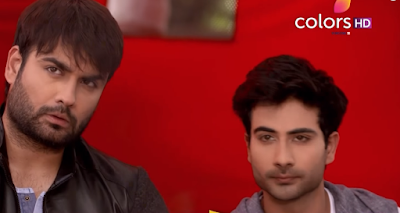 Thus in the series to come, Harman will be seen pleading before Soumya to return back in his life. The credit for union of Harman & Soumya goes to Saya and Kinner gang. The entre Kinner gang gives blessings to Soumya to stay happy forever with Soumya and requests her to return back to Harman. Harman will be seen taking Soumya forcibly. Will Soumya’s heart melt for Harman? Will Soumya make Harman confess her reality before everyone?